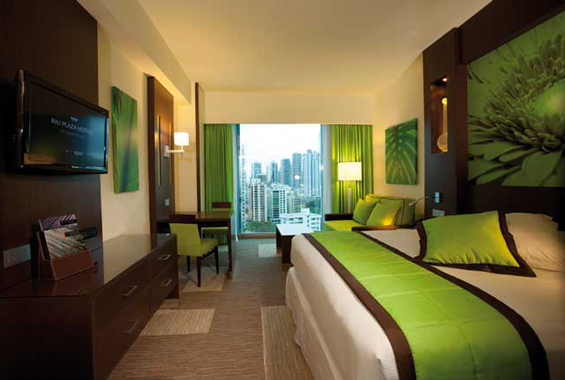 The heart of the financial district in Panama City is home to one of the most luxurious hotels in the country. Riu Plaza offers a unique urban experience with all of the amenities you could ever need for relaxation, including a fitness center, swimming pool, spa, and conference rooms for business events. The hotel has more than 600 rooms spaced out over 34 floors. Each room is fully equipped with modern amenities to make your stay enjoyable, from the free Wi-Fi and satellite TV to the coffee machine and mini refrigerator. 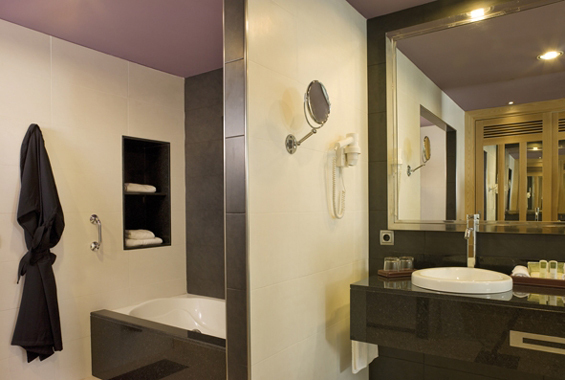 Guest rooms also have lounge areas in addition to other great services. While standard guest rooms are plentiful at Riu Plaza, guests who choose to upgrade to an executive room or suite receive extra perks. In addition to having a private check-in and check-out area, these guests are also provided with concierge services, a conference room, and various discounts at the hotel’s Renova Spa. If you’re visiting Riu Plaza for business, you’ll be glad to find a total of 23 spacious conference rooms which have a capacity of more than 1,300 people. These rooms are equipped with premium audiovisual equipment to ensure that your event or meeting is a success. Guests also have access to the hotel’s business center, which is equipped with high-speed Wi-Fi, a printer, photocopier, multimedia computer, secretary service, and other great perks. One of the hotel’s most shining features is the Renova Spa. This upscale spa offers an extensive menu of spa treatments, including couples massage, deep-tissue massage, sports massage, hot stone massage, and facials. The experienced technicians also offer other treatment options, including hydrotherapy, aromatherapy, and reflexology. Renova Spa is also equipped with other sources of relaxation, including a sauna and spa tub. The spa is open daily, allowing you to visit when you need it most. 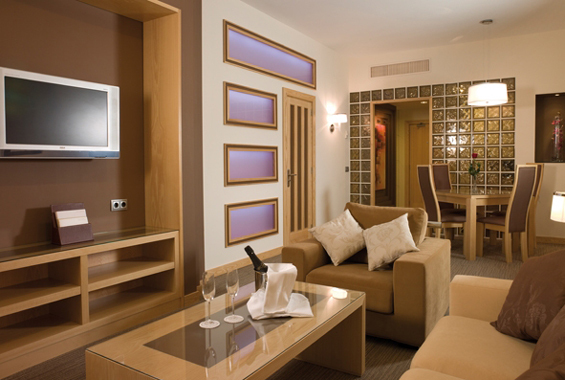 Riu Plaza is elegantly decorated with quality furnishings and décor, giving the hotel an upscale feel. The hotel is also home to several dining establishments where guests can grab a bite to eat without having to leave the hotel. At the Arts and Tastes restaurants, dishes are prepared by trained chefs, ensuring that you have an exceptional culinary experience. At Sushi Lounge Studio 50, the lobby, bar, and snack bar offers a wide range of delicious appetizers and beverages that are sure to fully satisfy all taste buds. 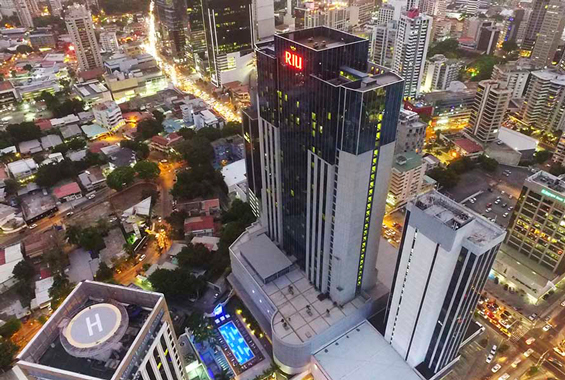 The area surrounding Riu Plaza is also bustling with great attractions and shopping opportunities, including the world-renowned Soho Mall located just a quarter mile from the hotel. A mere 10 minutes away is the Iglesia del Carmen and the Via Argentina subway stations. 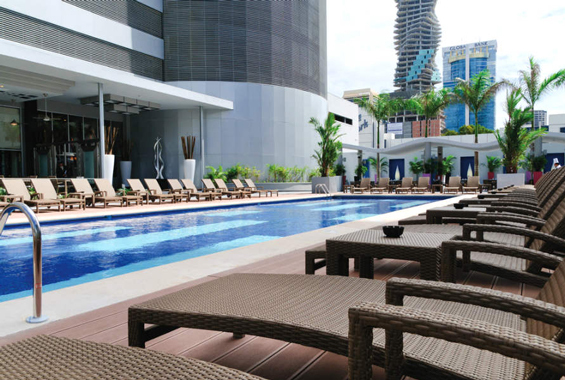 Having quick access to the subway stations make it fast and easy to get to nearly any location in Panama City. 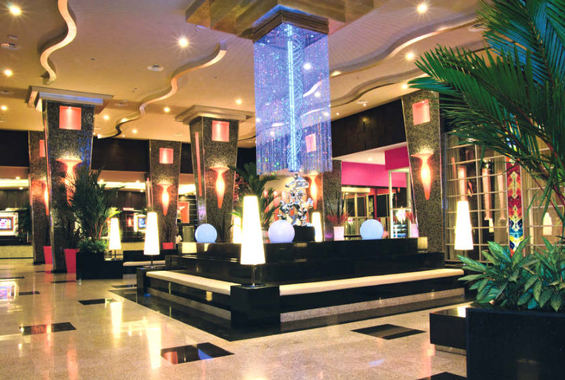 Riu Plaza is also just 13 miles from the Tocumen International Airport. Once you arrive in Panama, it’s just a short drive to the hotel where you can drop off your luggage and relax. Whether you’re in town for an event, a business endeavor, or simply for fun, a stay at the Riu Plaza is an excellent choice. 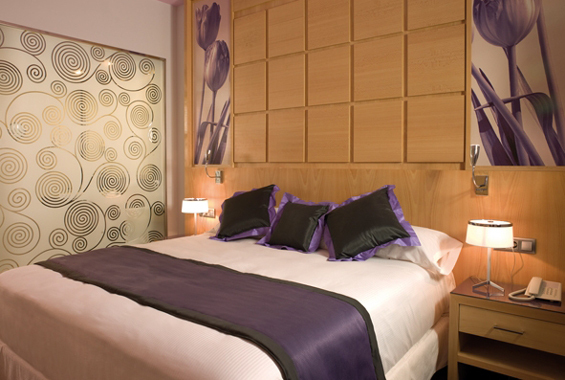 The ultra-modern, high-rise hotel not only offers a luxurious stay, it also provides guests with a true VIP treatment. In addition to free parking and a complimentary breakfast buffet, guests can enjoy four eateries, a 24-hour deli, spa, outdoor pool, and gym. This property has also been rated for the best value in Panama City. 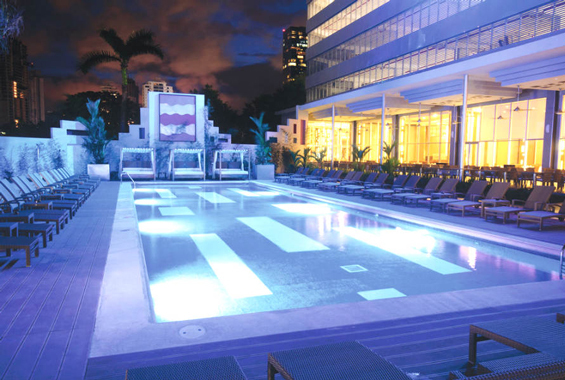 You can enjoy more amazing amenities for less. 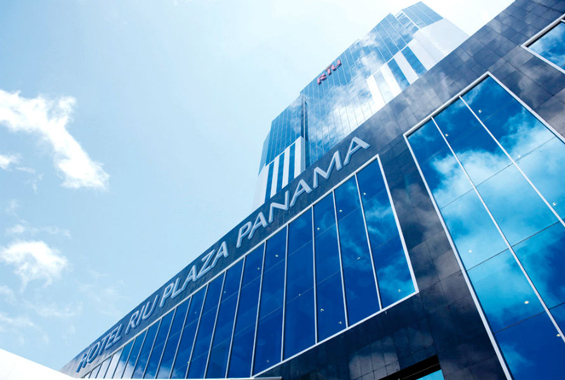 If you’re visiting Panama City for an upcoming vacation or trip, be sure to reserve a room at the Riu Plaza hotel.